This section shows you a number of selected images which demonstrate the capabilities of the Grayfield microscopes. Click on the respective image to enlage. 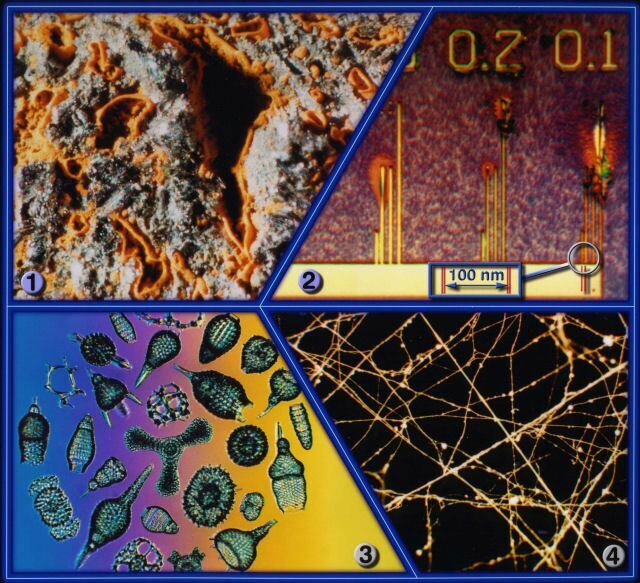 Cell tissue images of a pure living AIDS culture in its various stages of development. These images were made as part of a research project in Berlin during 1986. In this culture trial, three different sizes of the same virus were found. The growth of the virus is, amongst other factors, characterised by jumps made by the size B viruses. The AIDS viral particles, in live blood analysis, transform white light into a deep red colour, which means that its optical resonance frequency is to be found chiefly on this wavelength. Live blood slides show how a thin layer of leucocytes is segmented by the aids virus. Image 1: Magnification: 50x - Tiny pellets of methyl methacrylate MMA (Plexiglas®). This batch has been polluted by a soot explosion and can no longer be used to manufacture transparent products. Image 2: Magnification: 2100x - Chromosomes seen in their true colours. Fluorescent light, a high depth-of-field and colour contrast against a black background were used. Image 3: Magnification: 3800x - The red outer ring (a) shows the original size of an Aerosol spray droplet and the Legionellas. 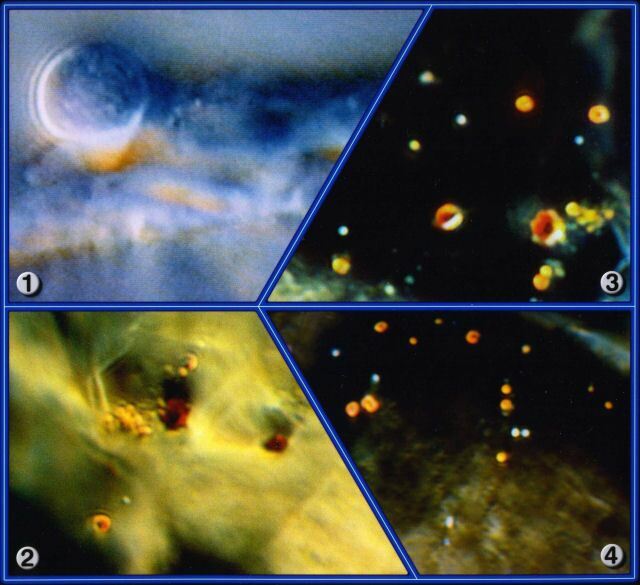 The blue inner circle (b) shows the Legionellas after the aerosol spray droplet has dried and shrunk down to this size. The Legionellas have assembled close together and go into a form of hibernation. Image 4: Magnification: 200x - Interior cross section of a pipe heavily encrusted with carbonate needles. The large depth of field and resolution allow this image to be seen in perspective with true colours. Image 5: Magnification: 2.6x - A thin cut of a plastic pipe connector seen in specially polarized light. The colour contrast method allows every nuance of the rich true colours to be seen, as well as the sharp notch of the predetermined breaking point.. Image 6: Magnification: 6000x - Fully grown Legionellas, shown in their living state, assembled on the interior surface of a pipe. This image has a large depth-of-field and sharp contrasts. Image 1: Magnification: 870x - This shows a special rolled aluminium material with a raised structure that allows grease to adhere to the material for a permanent lubricant effect. Image 2: Magnification: 470x - This image shows fibre structures on the surface of a special paper. The paper was being examined because of poor printing results in an irregular pattern. Image 3: Magnification: 470x - This is the same section as in image 2, yet seen at a deeper focusing plane. The cause of the uneven printing was found to be silicon oil residue from an aerosol spray. The microscope allows you to focus through different levels of the sample with full depth-of-field or with very fine depth-of-field, depending on the layer you wish to see. Image 4: Magnification: 870x - Another image of the aluminium surface treated with a special irritant technique to facilitate a permanent lubricant effect, as in image 1. Image 5: Magnification: 500x - This cut image shows inclusions of a cartilage layer. It is a micro thin cut, prepared for transmission electron microscopes (although without the usual surface treatment required for such microscopes), embedded between the upper and lower glass slides. Image 6: Magnification: 700x - This is a crystalline fluid, showing reproducible structures. This image was taken using maximum depth-of-field and colour contrast in order to solve a specific problem. Image 1: A cell observed during the mitosis procedure. Chromosome separation has already taken place. Image 2: Teleophase has been initiated. Image 3: Separation of mother and daughter cells, each of which has a half (haploid) set of chromosomes. Image 4: The organization of the membranes between both cells has been finalized. Image 5: Mother and daughter cells are being separated, as mitosis has been completed. 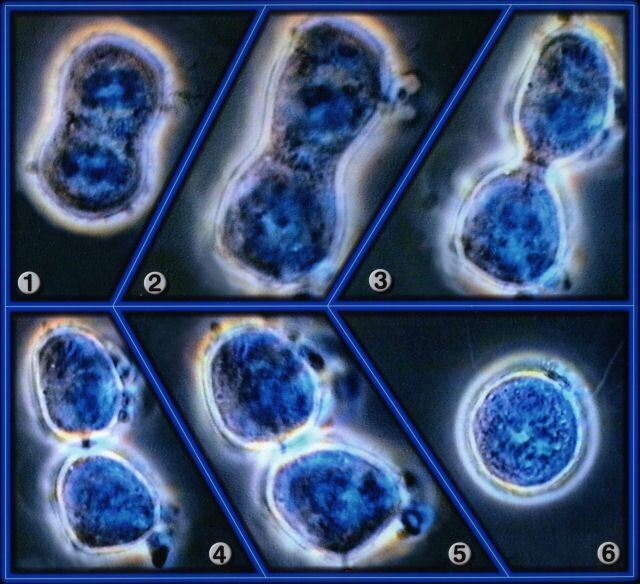 Image 6: Each cell is now autonomous and can initiate its own mitosis process. 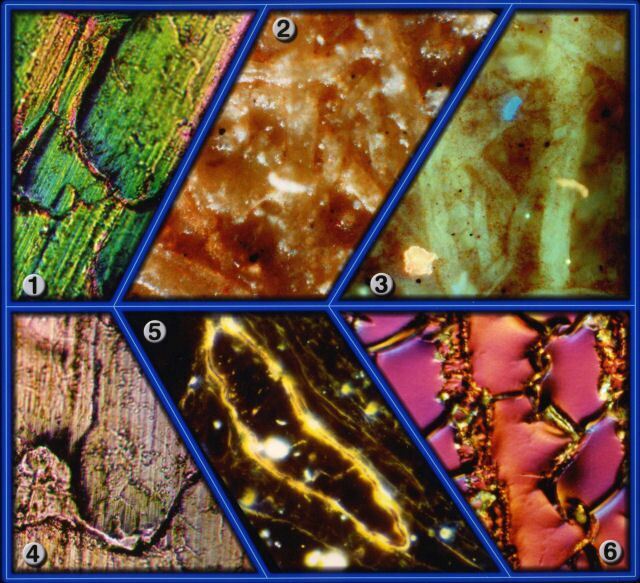 Image 1: Magnification: 150x - The highly porous, fractured surface of a cross member used in a vehicle. Moisture has accumulated in the pores, leading to intensive rusting in the cavity. The cross member now has only about 25% of its initial tensile strength. Image 2: Magnification: 15000x - A special chip surface with a calibrated and measured scale, ranging from 300 down to 100 nanometres, shows the extremely high resolution obtainable with the microscope using dry lenses and a normal halogen light source. 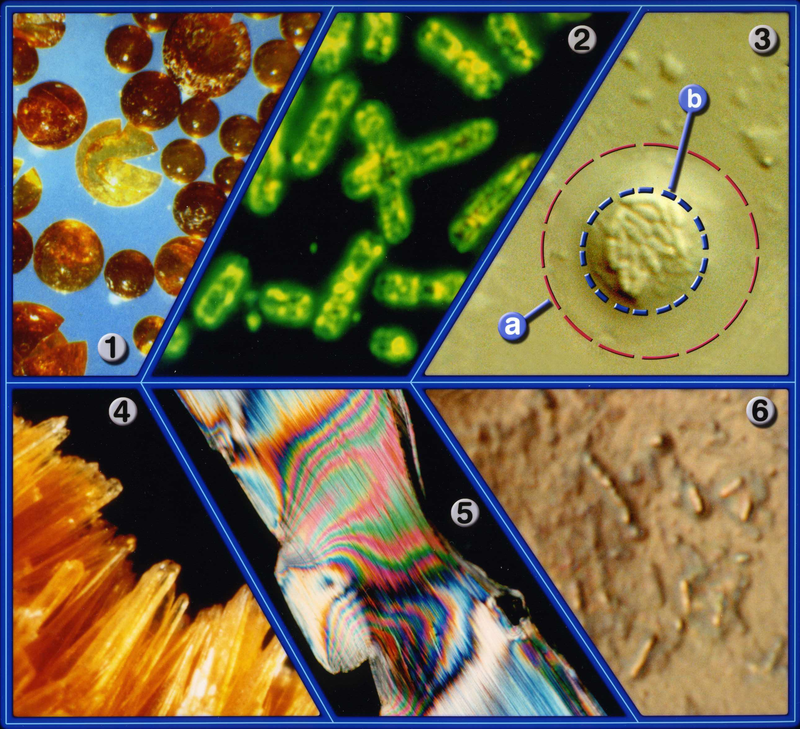 Image 3: Magnification: 100x - Display of several diatomeae (Pinnularia) at maximum depth-of-field and colour contrast. The differing background colours have been generated with special colour filters. Image 4: Magnification: 200x - Part of a cobweb structure showing the adhesive "pads".